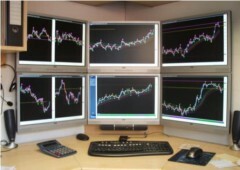 There are various shapes and forms of Forex trading stations. In order to have a comfortable trading profile, you should have a charting package doubled by a trading station. It should have an Entry Orders option, so that your entries don’t get deleted before being executed, as it usually happens. You should always be able to see your entries openly. This way you can reconsider future trading positions and change your mind anytime. Look for trading stations which require at least two steps for placing a market order. Avoid one-click executions because it can really get you into trouble. You may place multiple orders by mistake, just because you weren’t paying attention to what you were doing or you were focused on something else. A confirmation button for closing trades is more than necessary. A very helpful feature is the one allowing multiple trades simultaneously. There is the option for a two ways trading offered by some brokers. This means that you can buy and sell a pair of currencies simultaneously. However, when doing so, you should be careful to close the current trade before switch to the opposite one. For instance, if your account is short on dollars/euros, if you go for buying this pair, the current trade you are operating will not automatically be closed, but a new position will be opened. To close the “short on dollars/euros” position, click the Exit or the Close button. You should look for a trading station that allows you to be in contact with the broker’s client service, throughout a chat room, preferably. A report generating button is also an important feature. It offers you a good periodic feedback about your weaknesses and strengths. Before deciding on a trading broker, try the demo version of the trading account and the trading station, so you can learn about what it can and cannot do. Placing an order is technically easy and it only takes some clicks. However, you need to know what and when to click. There are two kinds of orders that can be placed: the Market Order and the Entry Order. The Market order is the closest to real buying. When there is something that interests you on the market, you place the order, just like at the restaurant or supermarket. You need to be very sure of what you want, because once you placed the order, there is no turning back. It works immediately. Buying currency implies serious consequences; it is not like buying some milk, forgetting about it and then throwing it away. In conclusion, Market order is very risky and not recommended. The Entry Order, opposite to the Market Order, does not happen instantly. It takes some criteria before it is executed. There are some conditions that you impose, such as value limits for when to buy a certain currency. The great advantage of this kind of order is that it allows you to change your mind and remove the order if you are not sure of your decision. There will be no penalties. You can get out when things start to turn bad on the market, so you avoid losses. Once you are in the market, there is little room for fixing a bad situation. Second guessing can happen any time before the order execution. This happens when the market has reached the point specified by you. With the Entry Order option, you can set the limit order, the trailing stop and the stop order. You don’t need to be stuck to the computer in order to place the order. It will be automatically executed when the market reaches the points you specified. The so called “news”, though, is a point when there is the possibility for you to get filled at some later point, at a slightly greater value than the one asked by you. A good thing to know is that you’d better avoid filling in an order at round values, such as 19500, for instance. A just above or bellow value is much better. Usually round numbers act as resistance and support by default. Although it’s not a rule, it still happens a lot.